Thurstanite Minhaj Jaleel is still cruising in the 34th Bata-the Sunday Times Most Popular Schoolboy Cricketer of the Year 2013, as the competition approaches its ninth week. It seems as if Jaleel has already consolidated his stronghold as the eventual winner though it’s still premature to make any firm judgments. The competition will run for nearly 10 weeks and during that time, as in the game of cricket, anything could happen. 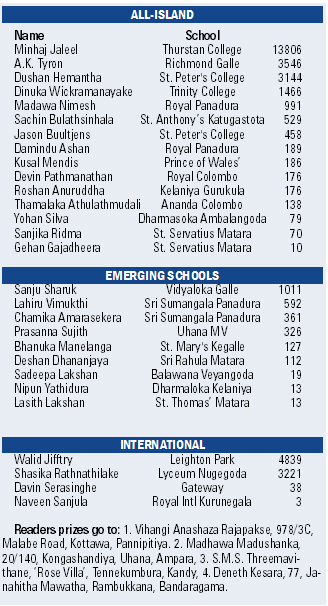 Coupons for the 34th Bata-the Sunday Times Schoolboy Cricketer of the Year 2013 competition will appear in Wijeya Newspapers’ dailies- the Daily Mirror and Lankadeepa- and also in its weekend English publication, the Sunday Times. Readers will be able to send in as many coupons as they wish in favour of their favourite schoolboy cricketer until the deadline on May 30.